A Dutch Parenthesis where Calm and Serenity Rhyme with Happiness and Family Life. This week, The Socialite Family have been to a little village not far from Amsterdam, to pay a call on the lovely Tessa. 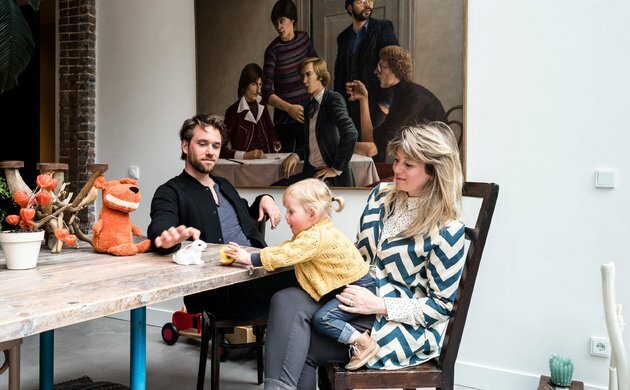 Tessa is a full-time mum of three intrepid and lively boys, who, for the moment has chosen family life over the life of a “having-it-all” mum. Having converted her home a few months ago, Tessa savours every moment and every hour with enthusiasm. This house is well and truly the house of her dreams. It’s a wooden house that’s spacious and full of light. 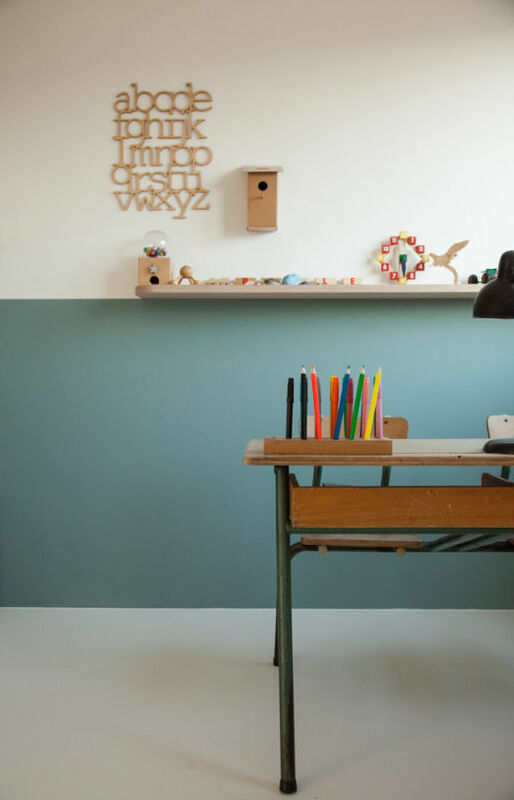 The walls are coloured in a palette of soft, almost faded shades in a natural interior of waxed concrete. Tessa chose to live a family life in a peaceful place to bring up her three boys. Everyone has their own space and freedom. It was Tessa who chose the layout of each room and succeeded in making the spirit of the place serene and peaceful, thanks to the omnipresent wood. She savours every hour of the day and every moment spent with her sons, photographing them and watching them grow up. 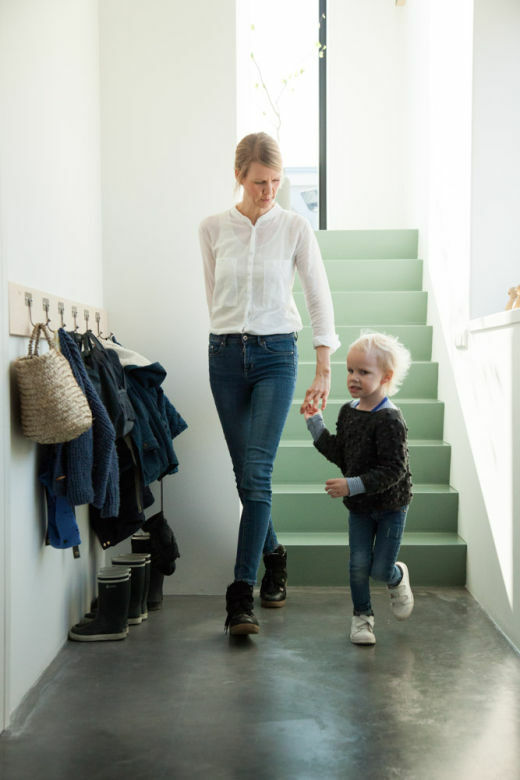 Her lifestyle makes us long for a big family, big spaces and simple times. Tessa gives us a lesson in serenity and calm, without artifice. A pick-me-up to inspire us and give us a break from our busy lives as mums in a hurry. Tessa, could you present yourself ? My name is Tessa, I’m 39 years old and a mother of three sweet boys. I live with Menno, whom I met 15 years ago in Rotterdam. He’d just opened his own French bakery and I’d recently finished my studies at the Rotterdam Academy of Arts. In order to earn my living I started working in Menno’s charming bakery shop just around the corner of my apartment. How long have you lived in this house ? When I was pregnant with our second child, we made the choice to move to Alphen aan den Rijn, the city I was born and raised. But when our third child was born, this house became too small for the five of us. 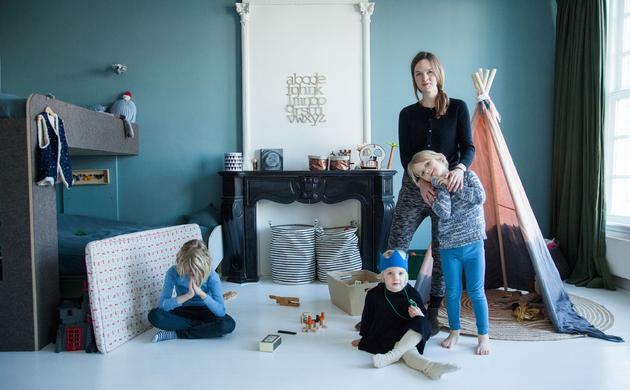 We thought of moving back to Rotterdam, and almost bought a terrific house in the city-centre, but decided finally against it due the impossibility of letting our children go to the school we wanted most. At the same time, an exceptional opportunity arose : the local government of Alphen aan den Rijn decided to sell plots of land without strict restrictions on how the houses built on it should look like. We had the very rare opportunity to fully build a house according to our design and wishes. We have been living in this wooden dream house since July 2015. Did you do the decorating ? What was important for you when building the house ? The most important thing in our design was a gigantic open living space on the ground floor. Before, we lived in a house where the kitchen and living room were on two different floors. In our current house, we wanted a large space so everyone could be together and still have sufficient space for people to do their own thing. In designing our dream house, the use of building and interior materials was very important. We chose sustainable and natural materials, which is clearly visible on the outside as well as the inside of our house. The house itself is made from sustainable wood, with wood wool insulation. For the interior design, we used a lot of birch plywood, concrete, wool and linen. Modular bunk bed in birch plywood. Dimensions: L205 x W95 x H162 cm. E60 Stool designed by Alvar Aalto in 1993. Four-legged version. Where did you find your furniture for your home ? Before moving in, I spent a lot of time searching the Internet in order to find special furniture and accessories for our new home but of course we took the old unique things we already collected with us. Most furniture we ordered online. Naturally, for more important items (like the couch) we visited real stores in order to see and feel what it was like before buying. The interior design of our house is something I do according to my feeling. The material plays the most important role in this process. I have this great love for wood, wool and linen. The pieces of furniture I like the most are all old pieces, like the old French cabinet we keep our puzzles and games in, the old rug of my favourite Grandmother (we use that as a door mat in our hallway), the old wooden kid chairs we found in France, and the real vintage couch in the television room for the boys. I love several Scandinavian furniture designers as well. We also have quite a few pieces of Dutch designers in our house, for example the beautiful wooden bed of Guus in which all our three sons slept. How would you describe your home style ? I think my style is best described as a contemporary mix of old and new, with a focus on pure and natural materials and colours. I like the serenity in our house. There is already a lot of excitement and vivacity around with our three boys, so it was very important for me to let the base of our house to be quiet and peaceful. And we succeeded! We are so happy with the result. We live and move so naturally in this new house. It’s so spacious and with all the storing space we have, it’s very rare that the house turns messy. 2 restaurants to recommend to us in Amsterdam ? Actually, my favourite restaurant of all time is in Rotterdam, and is named Huson. It reminds me of the time Menno and I were just together and often drank a glass of beautiful wine here after work. The food is light and tasteful, with an oriental touch and it’s the best food I’ve ever had, besides home. Come to think of it, Zinc and Z&M, both also based in Rotterdam, are also really special places. They both serve real, fresh food, with a lot of vegetables: simple but delicious bistro style French food. Designed Ed Carpenter. Pink pigeon lamp in perspex and beech wood. Dimensions: L21 x D10 x H23 cm. The best place for a drink in Amsterdam ? A wonderful place to have a coffee is the Urban Espresso Bar. (qui existe aussi à Rotterdam). (also based in Rotterdam). Their coffee is great and it’s a nice place to hang out. In Amsterdam, I like Hutspot, a concept store where you can go for a coffee or lunch and buy all the furniture they use. I must admit I also like Café Amsterdam, built in an old industrial water pump building. They serve decent French brasserie food, with a simple green salad and dressing on the side. And Menno’s bread of course ! I don’t have a dying wish for a piece of furniture, but come to think of it, I would love to own a beautiful vintage buffet. We actually found one on the Internet, and I do hope we find the time to visit the store in order to see it in reality and buy it if we fall in love with it. The house is really designed in a way that makes it a delight to live in for all five of us. The boys can play, run, skate and swing either way. Our furniture is not so fragile. The only real rule we have is not to eat on the couch. We wanted to create an environment for our boys in which they can play, live and be themselves. Even if that means an unexpected stroke of a marker on a very much unwanted place. Your best holidays with your big family ? We love to spend our holidays in France. Menno speaks French fluently, after attending the famous bakery school in Rouen (Normandy) and working and living for more than a year in Paris. I really love the French countryside. The last three years we stayed in a beautiful wooden house near Uzès, in the South of France. 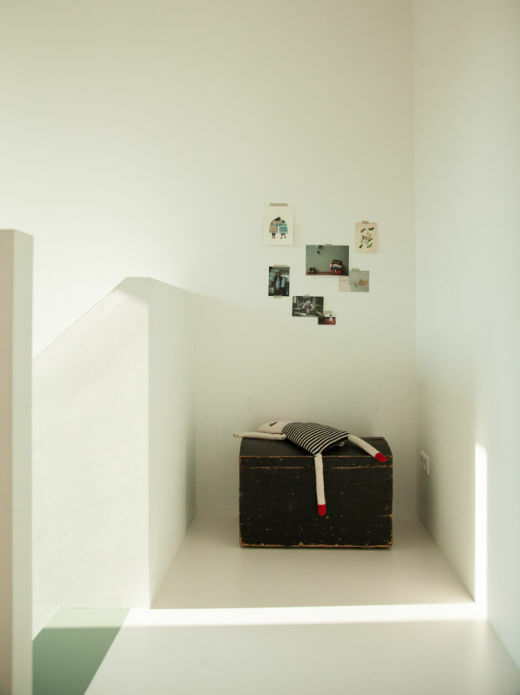 It’s very spacious and full of light, and it’s actually the inspiration for the design of our current house. The French house has a lot of bedrooms, and a real spacious and great living room, a private swimming pool in the garden, and the long stretched beach near Montpellier in less than an hour drive. We all love to come back here in the summer, but this year we’ll do something completely different. We hired an enormous camper, and will be heading North. With my love for Scandinavia, I’m really looking forward to showing my three boys this part of Europe. We’ll be travelling like this for the first time in our lives with all our three children, so it feels like a real adventure to all of us!